In this week's episode "Scared Silly" we're looking at evil clowns (yes, that is redundant). Who will channel their fears into cool designs and whose design will be just frightful? Results ahead. The challenge is to make a clown that reflects each contestant's biggest fear. Additionally, the makeups will be applied to actual clowns who will perform a routine so that puts some constraints on the designs. Cig's design (also shown at the top) reflects his fear of dark water. Dina's fear of tornadoes (?) 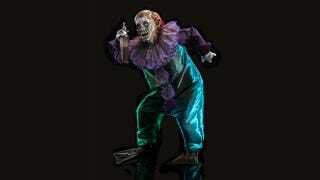 is shown in this clown who was caught in the middle of one. Sasha took a chance (which is usually a good idea on Face Off if you can pull it off) and based on her fear of old dolls made an evil doll clown. She won this week's challenge and earned her save from a couple of weeks ago. In contrast, Damien's conventional approach didn't impress the judges at all and he ended up going home. All images from Syfy's Face Off site and you can see all the designs here and here.